FINDING time to exercise can feel like the mother of all challenges for busy parents. Fitness expert and physiotherapist Lisa Westlake said squeezing workouts into busy schedules could be challenging. "People are very busy and finding time to exercise can be really tough," she said. "If we think of our bodies as a machine we need to look after ... finding time needs to become a priority." The author of Exercising For Two and Mums Shape Up said parents often put themselves last. "Everyone will benefit if you look after yourself and treat yourself to healthy, fresh eating, plenty of H2O and make exercise a priority," Ms Westlake said. She said new mothers should enjoy bonding with their baby and avoid risking long-term damage by launching into intense workouts too soon. 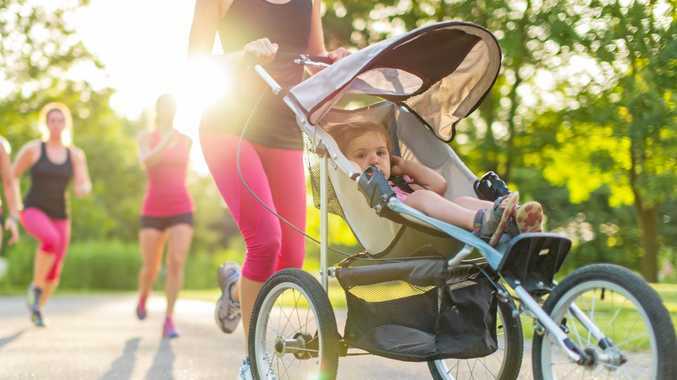 Once mums had their strength back, she suggested options such as walking the pram, joining a mother and babies exercise group or doing 10-minute sessions at home when the baby was settled. "It might be squats, lunges or core work on a Swiss ball," Ms Westlake said. "For a young mum who's at home with the baby, if you wait for a time when you get an hour to exercise it might not happen but if you get in 10 minutes twice that day you feel positive about it." She said parents could turn catch-ups into workouts when their kids were slightly older and make use of free playground equipment. "Say you go to the park with four friends and take it in turns with two looking after the toddlers and two doing laps or step-ups then swapping," she said. She advises diarising exercise and choosing an activity you enjoy that can fit into your lifestyle. "Can you team up with a friend and say you'll meet them three mornings a week to exercise or get a group going in your lunch break?" Parents could also look for opportunities to be active, such as jogging laps while their kids played sport or exercising as a family. "It's quite well proven that if parents exercise with their children their children will grow up to be more active because it becomes part of their daily life," she said. "It's a good educational and habit-developing activity if you all go out for a bike ride or walk together." Motivation: Do you want to lose a few kilos, have more energy or improve your fitness? Write it down and stick it on the fridge door. Assess your ability: What exercise suits your body and what sort of activities can you do? Good goals: Set small, achievable goals to start out. For example, aim to walk 20 minutes a day, three times a week for three weeks then increase it. Identify your plan: What do you need to do to reach those goals? It might be join a gym or buy running shoes. Commit: Put it in your diary, get friends on board or hire a trainer. Put your plan into action.